This is guest post #2 from my friend Amanda from The Homemade Cook. See post #1 here. It’s like these lovely gyros with their homemade tzatziki sauce are calling my name… and I’m responding, Renee Zellweger style. What I love about the all-purpose pressure cooked shredded pork that we shared on Monday is how versatile the leftover pork is…exhibit A being that lovely gyro above! And…I’ll be sharing Amanda’s amazing Shredded Pork Nachos recipe on Monday! Grate 1/2 the cucumber and then slice the rest of the cucumber in half lengthwise, remove the seeds and cut into half moons. Make the Tzatziki sauce by mixing the grated cucumber with 1/2 teaspoon of salt and let it drain for 30 minutes. Squeeze out the cucumber, then add it to the yogurt with dill, lemon juice, red wine vinegar salt and pepper. (This is best overnight, but let sit at least 30 minutes). 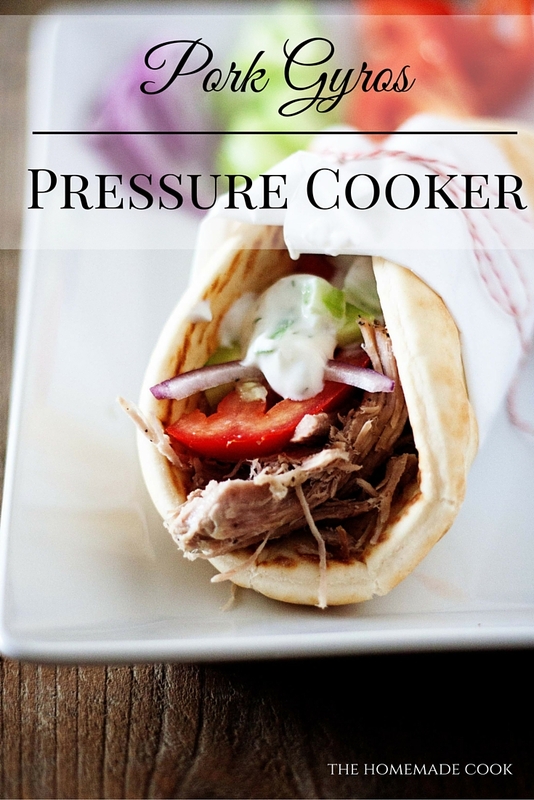 Top a pita with shredded pork. Layer on some Tzatziki sauce, onion, tomato, and cucumber slices. Roll up as best you can. Serve Pork Gyros with a side of fresh fruit.